It is precision CNC machined right here in the UK from Duracon (Thermoplastic). The properties of Duracon mean it will not get too hot or too cold and it is very easy to keep clean. It feels lovely to the touch and is very tactile. However all did not run smooth, as a mail order item it seemed to take forever for me to get my hands on it and when I did the 'stick on' shift pattern for the top of the knob was missing. A few emails and a week later the small but vital part turned up. 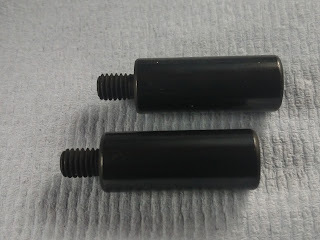 The shift has an M10 internal thread, so is the right fitting for a Skyline GTS-25t and screws on without a problem. After all the effort involved in getting it I am not actually going to use this item at the moment. One problem with it is that it sits very high on the gear stick so that there is a space between the knob and the leather gaitor. 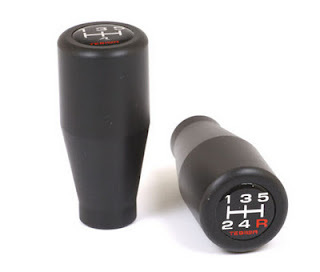 I suppose with a bit of mucking about you could get the gaitor to fit snug against it, requiring the neck of the gaitor to be really tight against that of the shaft of the gear stick. However as I already have a leather Nismo gear shift knob which I like, I didn't feel the pressure to try and muck about! I may revisit this later 'just because I can'. So a bit of a mixed review. I think in general it is a good product (probably great on a Honda), but I really wish I hadn't bothered!